I love beetroot's eye-catching, wacky colour; it's one of my favourite vegetables. I like beetroot fried, puréed or baked and I sometimes make jellies from the fresh juice. This gratin uses it to make a soothing, creamy dish. 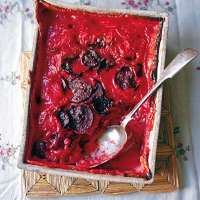 Just watch how you slice the beetroot: it needs to be quite thin – a mandolin works best – or the gratin will be in the oven for a really long time. Put the cream, garlic and thyme in a pan. Bring to a simmer, and remove from the heat. Leave to infuse for 10 minutes, then pass through a sieve.